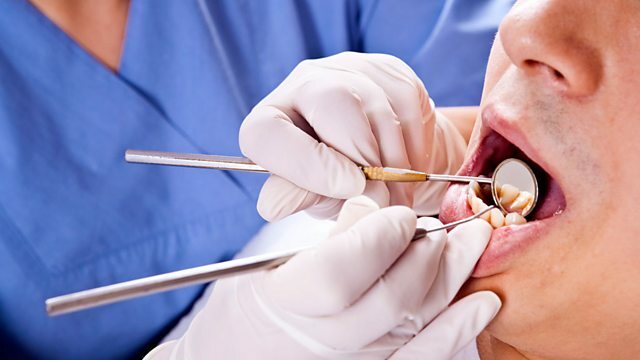 Winifred Robinson explores how some dentists are working without proper insurance or scarpering abroad when things go wrong - how are they getting away with? And recording the conversation we all dread - a diagnosis of cancer. We'll be hearing from some people in Scotland doing just that. A group of lawyers (Bridge the Gap) are campaigning for it to be compulsory for dentists to be insured. Rules from the European Commission mean that food manufacturers have to comply with 'permitted' claims for food. Figures out today show that there is a slight drop in people listening to Digital Audio Broadcasting. Is the industry target of a switchover by 2015 just too optimistic? A pressure group in Sweden is advocating that people do not pay their train fares as a stand against high prices. The organisation has just published a manifesto with a grant from taxpayers money. In Edinburgh men who have prostate cancer are being offered the chance to take home a CD recording of the doctor explaining their diagnosis. A community in Lancashire who have no broadband has decided to lay its own cables to connect 2000 homes and businesses. Regulations mean that building work has to meet set standards. There are different ways to certify your building work.